The body of work known as “polarity thinking” (or “polarity management”), pioneered by Dr. Barry Johnson, provides a practical and sophisticated method for leveraging dynamic tensions (or polarities). 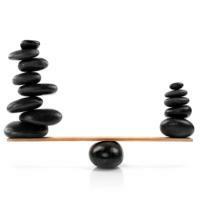 Polarities are situations like seven key tensions described above, in which both conflicting points of view are true. When leaders manage this ongoing, natural tension, they can often channel it into a creative synergy that leads to superior outcomes. Leveraging polarities involves making a fundamental distinction between solvable either/or problems and both/and polarities, which are inherently unsolvable (but leverage-able). The ability to shift from exclusive reliance on either/or thinking to leveraging both/and thinking is a critical competency for success in an increasingly complex and interdependent world. Tremendous breakthroughs can occur when forward-thinking organizations learn to harness the power of polarities to their advantage. Russ Gaskin is chief business officer of Green America and a special guest contributor to Rethinking Complexity. He is also a teacher and consultant on social innovation and shared value creation. Through his consulting practice, CoCreative Consulting, Russ helps companies and multi-stakeholder groups generate innovative solutions to chronic challenges. Russ holds a master’s degree in organization development from American University and the NTL Institute. NOTE: This post was originally published by Pegasus Communications‘ blog, Leverage Points, on September 15, 2011. It has been republished here with permission.